The goal of NICH (National Initiative for Consumer Horticulture) is to get 90 percent of U.S. households gardening by 2025. 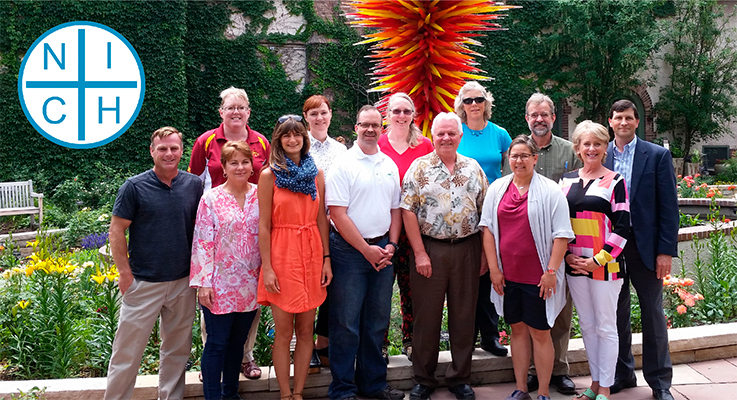 NICH leaders and advisors met at the Denver Botanic Gardens in June 2016 for the 2nd NICH strategic planning retreat. From left to right, back row: Cyndi Haynes (Iowa State University), Shannon Spurlock (Denver Urban Gardens), Lucy Bradley (NC State University), Susan Mahr (University of Wisconsin), Tom Underwood (American Horticultural Society), Casey Sclar (American Public Gardens Association). Front row: Rusty Collins (Colorado State University), Ellen Bauske (University of Georgia), Jessica Romer (Denver Urban Gardens), Dave Close (Virginia Tech), Tom Bewick (USDA-NIFA), Gail Langellotto (Oregon State University) and Suzi McCoy (Garden Media Group). Since its inception, NICH has aligned dozens of organizations, crafted a mission and vision statement, and developed a working set of core values, goals and associated objectives. NICH’s vision is to “use stakeholder partnerships to increase the percentage of U.S. households participating in consumer horticulture to 90 percent by 2025.” Three goals were crafted to address the potential benefits consumer horticulture will have on community, economic and environmental systems. Specific objectives were also developed to guide work on each goal. Our organizational structure allows us to recruit nationally known leaders including researchers, extension agents, master gardeners, nonprofit directors, growers, retailers and industry providers. Three goal committees (Community, Economic and Environmental) interact with three advisory councils representing different consumer horticulture sectors. The goal committees prioritize and plan work to fulfill the initiative’s mission. The councils (Land Grant, Commercial and Non-Profit) each provide industry- and sector-specific input and guidance. The Executive Committee manages the general business of the organization and ensures equality and open communication to all stakeholders, supported by marketing expertise. By developing a cohesive voice, NICH will position consumer horticulture to be more successful in leveraging public funding from USDA’s Specialty Crop Research Initiative and other sources, thereby growing the entire industry. NICH will conduct comprehensive industry-wide research; implement prioritized research objectives; document economic impacts; and articulate the social and environmental benefits of consumer horticulture. First and foremost is to join the organization. If you are unable to commit to more active efforts, you could be involved by monitoring future growth and successes via the listerv (sign up at goo.gl/2MH2tY), or you could recommend someone who should be involved in an industry grant review panel.